As we grow up, our nightmares tend to grow with us. Our adult fears usually reflect more upon real-world dangers as opposed to the child’s vivid imagination of a boogeyman hidden under the bed. Yet, for some reason, many of us strive to revisit our pre-adolescent jitters. We read horror novels to unsettle us, we watch scary movies to unnerve ourselves with, and sometimes, we play video games in an effort to experience the feeling of being stalked by the unknown first hand. This is where Little Nightmares: Complete Edition excels. It doesn’t concern itself with the cheap jump scare that we usually expect to be the payoff. Instead, it suffocates you in the simmering anxiety leading up to it. Little Nightmares: Complete Edition binds the circle by giving you access to the whole experience right off the bat. You have a choice between the front cover protagonist known as Six or the Runaway Kid that leads the downloadable content trilogy pack, Secrets of The Maw. What is The Maw you ask? It’s a huge floating tub of iron out at sea, a deeply unsettling place that has an interior eerily reminiscent of a leaky Freddy Krueger boiler room. Everything has a grimy, damp and grotesque visual sense of neglect, like a mish-mash of Henry Selick’s Coraline, stirred up with Pink Floyd’s 1982 music video for Another Brick In The Wall. If you have ever played Limbo, you will more than likely find yourself instantly comparing the two. Well, for the first half hour at least. It starts out very similar to the black and white puzzle platformer as you push, pull and climb your way through a series of environmental puzzles while cautiously avoiding certain death. It’s a slow burner to begin with, but the timing on how it changes up the formula is as sharp as a headline stand up comedian firing back at a smart-arse heckler. The moment you begin to sigh at the slew of similarities is the moment Little Nightmares: Complete Edition truly catches you off guard. They say that actions speak louder than words and that’s most certainly the case here. Every frame of animation in place is intricately implemented with an unsettling organic sense of realism. Based on actions alone will make you care deeply for the little yellow rain mac wearing juvenile, while the prowling slobs that wander The Maw will give you plenty of reason to fear them. Watching Six hiding patiently under a stool as the crawling fingers of the long-limbed Caretaker worming his way towards the little girl’s direction is a breath-stealing moment, to say the least. The sound is incredibly effective too. Every cough, splutter and creak drives the atmosphere and intensity even further, as Six tipper tappers across a hard kitchen floor in her bare feet looking for the next tiny crack to sink into. When playing it on the big screen, it’s a gorgeous yet grim looking game that runs very well on the hybrid console. Ensuring you have the in-game brightness fixed at the sweet spot, its dense, dark shadows provide plenty of depth and atmosphere that draw out the small nightmarish details, making it one of the better-looking games on the Nintendo Switch. It does come across a little soft and fuzzy when playing undocked to the point that it can struggle to capture the same essence of when playing it on the TV. However, curl up with a decent pair of headphones strapped to your head in a dark room, and your eyes will soon adjust to immerse you back into the depths of The Maw once again. Despite running seamlessly well throughout, the loading death screen can linger on the lengthy side. To be fair, it does load massive sections at a time and you do deserve a penalty in failure. It’s more the fidgety plunge that can frustrate when your sense of distance is a bit obscured. I did find myself clenching onto the grab button a lot to ensure that I wouldn’t slip from a ledge without a backup plan, which did reduce the whoopsy daisy moments quite significantly. It’s an incredibly short game too, taking less than five hours to beat the main campaign. Although the included downloadable does flesh the value out a bit more to what is, overall, a very memorable experience. 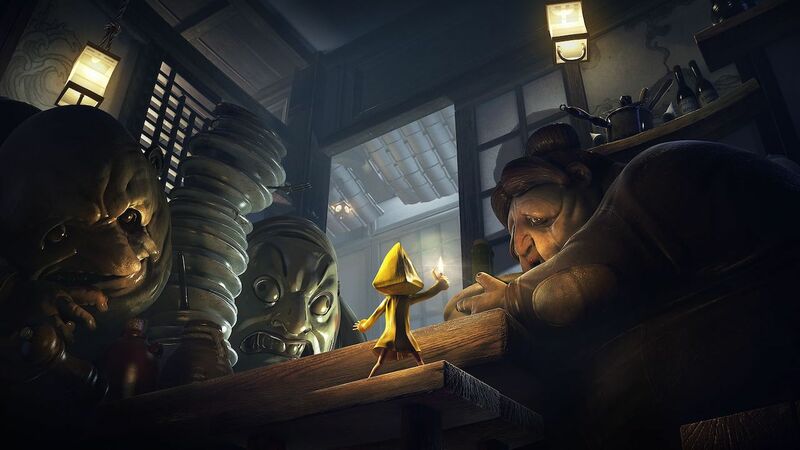 Little Nightmares: Complete Edition is the type of game that will train you to live in the shadows, only for it to drag you out into the blinding spotlight. Its clever mix of visual storytelling and careful interaction makes it one of the most atmospheric titles that you can find on the Nintendo Switch. Just the dancing flame from Six’s petrol lighter would take me back to lying in bed as a kid, watching the shadow of the outside world crawl across my bedroom walls. The dark and disturbingly obese undertones, on the other hand, reflect back to watching 1989 indie horror flick Society for the first time. To put it bluntly, Little Nightmares: Complete Edition is not only interactive storytelling at its finest, it also manages to pull it all off without ever having to utter a single word.